Poor Jane Austen never lived such an exciting life until after she'd been dead a few centuries! 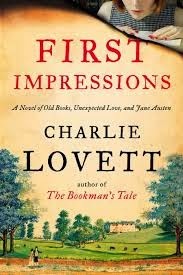 The book First Impressions had a Jane-centered mystery at its heart, traveling back and forth in time between Jane's time and the present. A young Jane meets the 80 year old Rev. Richard Mansfield and delights to discover that he is someone she can discuss literary subjects with. They spend a great deal of time together and Jane shares her literary ambitions with him. She's been busy with a work called "Elinor and Marianne" that she lets Rev. Mansfield and her family read as she completes each section. She hasn't yet attempted to get anything published, so she's somewhat thrilled to learn that Rev. Mansfield has published a book entitled "A Little Book of Allegorical Stories." Talking with Jane gets Rev. Mansfield thinking about putting out a second edition of his work. In the present day, Sophie Collingwood has just graduated from Oxford and finds herself at something of a loose end. She loves literature (and Jane Austen in particular), but she's not really sure what sort of job that will lead to. As a bibliophile, she's had the great fortune to grow up in a stately home, Bayfield House, with an enormous library. Unfortunately, her father keeps the library and the books locked up except for occasions when there are special visitors to the house. Luckily, his brother Bertram is a fellow book lover who takes a special interest in Sophie. She makes frequent visits to Bertram's London flat, and he takes her with him as he visits bookstores and book sales in the capital (shouldn't we all be so lucky to have such a doting uncle!). Since he must agree to any disposition of property at Bayfield House, he has so far successfully blocked his brother's attempts to sell off books from the library to pay for repairs to the family home. One day, when Sophie is visiting her parents at Bayfield, there is terrible news. Her beloved Uncle Bertram has fallen down the stairs and died. Sophie is devastated, and can barely function for a while. When she does finally accept the news, she learns that Uncle Bertram has left his London flat to her. She is sad to live there under such unhappy circumstances, but consoles herself with the knowledge that she'll be in a place she loved, surrounded by her uncle's beloved books. When she arrives in London to take possession of the flat, she's dismayed to discover that all the books have already been sold -- her uncle's will didn't specify that the books belonged to her, only the flat, so her father has sold the books to help pay Bertram's debts. Because Sophie had accompanied her uncle on his many book-buying jaunts, she is a familiar face to the booksellers of London. She is offered a job as an assistant in a bookstore she used to visit with her uncle. Not long after she starts working there, she's stunned when two separate buyers contact her and ask her to locate a specific book for them: the 2nd edition of Rev. Mansfield's "A Little Book of Allegorical Stories." One of the potential buyers is the charming and handsome Winston Godfrey. The other one, who only ever reaches her by phone, is the sinister and threatening George Smedley. Both are desperate to get their hands on this book, which doesn't seem to exist, but Sophie has no idea why. Sophie begins a relationship with the hunky buyer, Winston, while at the same time having feelings for Eric Hall, an American she met briefly before he left to tour the continent. Eric continues to send her postcards and gifts, but Sophie has a hard time carrying a torch for him with the gorgeous Winston much nearer to hand. As Sophie attempts to figure out the mystery of the Mansfield book, she begins to suspect her Uncle Bertram's death might not have been an accident. Could her life also be in danger? I enjoyed the story and the shifting time perspectives. It was a bit disturbing that Sophie went around during her investigations stealing anything she thought might help her in her quest. I found it a bit hard to believe that the bookstores and archives she pilfered from didn't at least have some cameras or alarms in place to watch over some of their valuable and irreplaceable property. Surely the story could have moved along with wholesale theft! Still, it was an interesting story and I enjoyed the build-up of suspense as we learned why everyone wanted the second edition of the book -- not to mention which of Sophie's suitors she would end up with.